A huge safe with a capacity of 36 long guns. � hour ETL fire rated. Meets California Department of Justice Standards for firearm safety and burglary rated. Steel safe with gloss finish comes in Black. It uses five (5) live locking and three (3) dead bolts for security. The GS3659E is a � hour ETL fire rated safe up to the temperature of 1400�F. The items inside the safe will remain un-affected at this high temperature. It also meets California Department of Justice Standards for firearm safety. 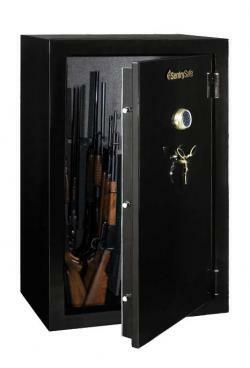 The gloss finished safe comes in black color with brass and chrome hardware. It also features a beautiful star shaped handle which adds elegance to the whole look and feel of the safe. The interior is capable of storing 36 long guns and can be configured in four different ways as required by you. The interior is fully carpeted for care and protection. The electronic lock with an override key prevents any theft and wrong attempts. The steel plate and 8 locking bolts add extended security. It can be bolted to floor (hardware included). SentrySafe started in 1930 and is today the worldwide leader in manufacturing business safes, commercial safes, home safes and gun safes. SentrySafe manufactured the first UL classified fire-resistant safe, first fire-resistant data and document security product that allows connectivity, via USB, to computers. SentrySafe values innovation, quality, growth and loyalty. It continues to make impressive and ground-breaking improvements. SentrySafe Fire-Safe products protect your documents and ensure protection of electronic media like CDs, DVDs, USB Drives, and Hard Drives. 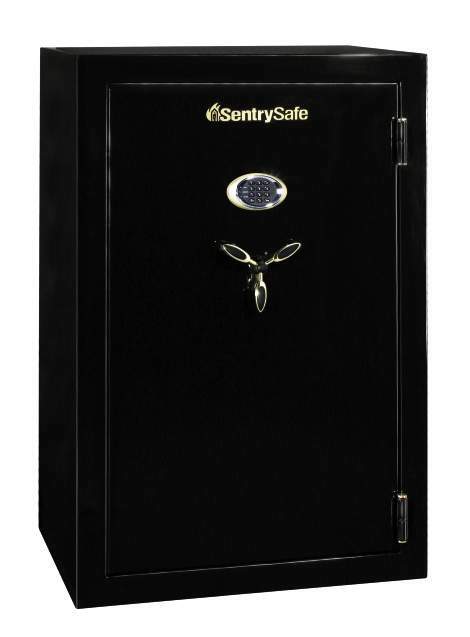 The H2300 Fire-Safe, GM1055 series fire rated 10 gun safes, DS3410 Black Fire-Safe and Waterproof Hard Drives are among the most popular products. SentrySafe is committed to produce high-performance products and guarantees 100% customer satisfaction with their lifetime after-fire replacement guarantee. Today, Sentry Group produces more fire-resistant chests, safes, file cabinets, security storage containers and gun safes than any other company in the world. Safes keep important documents, papers, objects and media hard disks safe. There should be no compromise when it comes to the safety of important and secret documents from any disaster or theft. Safes come with many different features and lock options. Safes can be fire proof, water proof, impact proof, explosion proof, and burglary proof. Lock options include key lock, combination lock or electronic lock. FireKing and SentrySafe manufacture high quality fireproof safes. 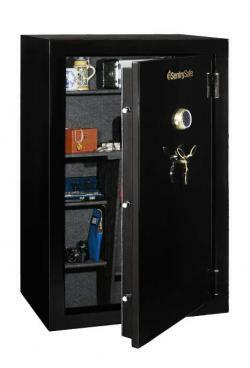 FireKing's Gary series and SentrySafe's electronic lock safes are popular safes. ETL and Meets California Department of Justice standards for firearm safety. "Great Service, price and experience. THANKS KEVIN!"